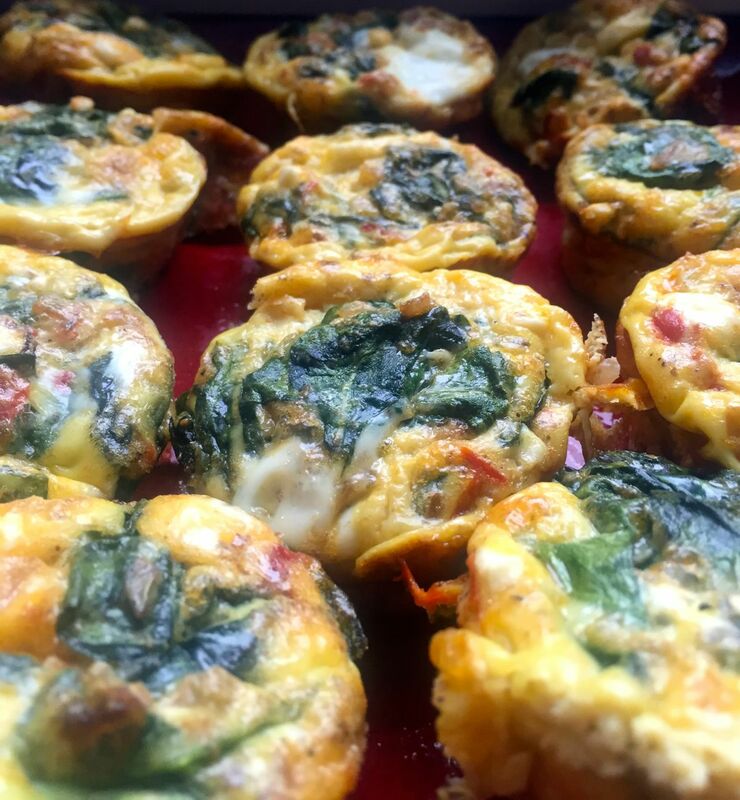 These easy mini crustless quiches work very well for a weekday breakfast (make ahead on Sunday, then grab and go) or lazy weekend brunch (with bloody Marys or mimosas, am I right?). But it also works for dinner. You could make the 9-inch pie version, then serve a wedge with a simple green salad on the side, a glass of crisp white wine, and a happy sigh. To make the mini version, you use something you probably already have: a muffin tin. That’s right. Mini or regular. Your choice! The recipe magically makes exactly 12 mini-quiches or one 9-inch pie. The first time I made this, I didn’t have a red bell pepper on hand so I substituted a few mild Peppadew peppers. It adds a nice piquancy to the dish, but the red pepper is very nice too. I’ve adapted this from the aptly named The Best Casserole Cookbook Ever. If you love casseroles, this book is for you. Equipment: Large skillet, 9" pie plate or standard muffin tin. Preheat your oven to 375 F. Liberally spray your pie plate or muffin tin with cooking spray. In a large skillet over medium heat, heat 2 T. olive oil, then add onion and bell pepper or Peppadew peppers. Sprinkle with oregano and a little salt and pepper. Cook over medium heat, stirring occasionally, until onion and pepper are starting to brown a little. Add the spinach and continue cooking and stirring until the spinach just wilts but still has a little body. Spoon onto a dinner plate and let cool (you can work with it while it's still a little warm, but make sure it's not enough to cook the eggs when you mix them together). In a medium bowl, whisk together milk or half-and-half, eggs, salt and pepper. Add feta cheese and veggie mixture, and stir well. Pour into your prepared pie pan or muffin tins (I find it easiest to use a small ladle for the muffin tins). If you're doing the muffin tins, make sure each one gets some feta and veggies. Bake! For the pie plate, you'll need about 45-50 minutes. For the muffin tins, you'll need 28-30 minutes. When done, the eggs will be set in the center, the edges slightly browned, and the whole thing slightly puffed. Let stand for 5 minutes and de-puff, then if you're using the muffin tins, slide a small knife around each mini-quiche and lift each one out with a soup spoon onto a serving platter. If you're using the pie plate, just serve wedges. Enjoy! I made these this morning for our Easter brunch at work. Everyone loved them! They all remarked on how cute they were. Next time I will really spray the heck out of the pan because they were a little tough to remove, but they still looked and tasted great! Thanks Shanna!! Love yours too, and your photos are always beautiful. Let me know if you try it!